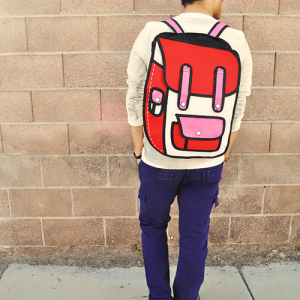 SALE 34% OFF SALE | Free Shipping Worldwide on all Cartoon Bags! The cartoon bag that has a face! Choose the one that fits your personality the best and grab it now while it’s on sale with FREE SHIPPING! Now you can enjoy faces on your cartoon bag. Choose from three different expressions on three different colors! What better way to add even more personality to your 2D Bag than a face! A little pocket that is perfect for storing your phone in the rear of the bag. Innards are made of polyester, plastic, and nylon to protect your valuables.